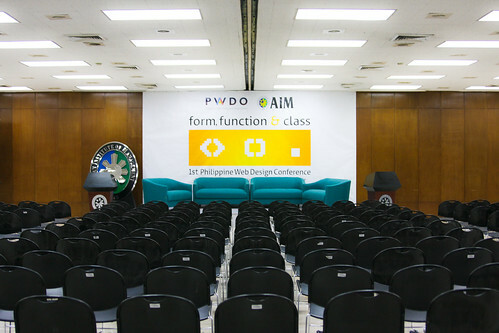 An unapologetic, uncensored list of lessons learned from the <form> function() & class Philippine Web Design Conference last July 10 at the Asian Institute of Management, Makati—because if we have to figure out how we can improve next time, we might as well start with ourselves. It was a bit rocky at first, but thankfully our long list of volunteers from UST ISyS, UST TomWeb, iAcademy, UP ACM, and UP CURSOR handled the queues well. My only regret was not being able to streamline the process further, but something tells me computer-based data entry would only slow things down. Mae, our speaker relations officer (SRO for short! ), was on the verge of multiple breakdowns when she couldn’t contact several of our speakers who were running late. Of course we couldn’t blame anyone since every single one of us was up against Murphy’s Law then, but next time there has to be extra extra leeway for the most important component of the conference. It was a bit naive of us to spend so little on it, and consequently got what we paid for. Of course the reason was simple: a glaring lack of funds before the day of the event. We weren’t exactly confident about spending anything big. We were lucky to get into a partnership with AIM so that we wouldn’t have to worry about 50% downpayments on the big-ticket items. At least now we have funds we can work with. Next time we’ll have to make the food count. It’s a whole-day affair, after all. Perhaps this wasn’t a big deal for the majority because that’s not what they came for, but it was a web conference; and the experience could’ve been improved. We were pretty geeky, but apparently not geeky enough. 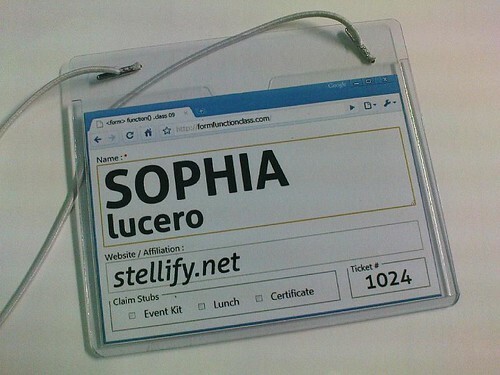 I’m particularly proud of the conference IDs—the web browser motif varied depending on your affiliation. 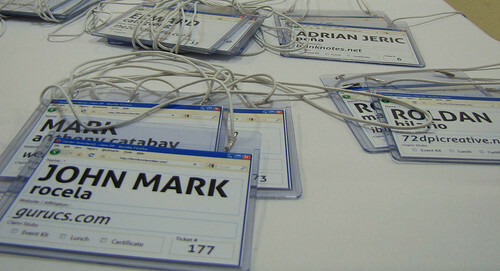 Attendees had Firefox. Media and sponsors had Internet Explorer. Speakers had Safari. 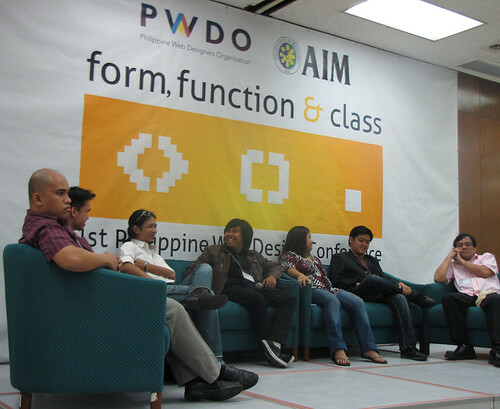 PWDO had Chrome. Volunteers had Opera. Live tweeting and plurking went well; the liveblogging not so much. I’d blame it on the wonky internet, but it was also because everybody had something to attend to. I guess you shouldn’t promise something you can’t deliver. And why liveblog when you can microblog, the very definition of the real-time web today? Maybe someday we’d have snazzier systems in place—when we get to “Apple Keynote status” or something. Lastly, the projector screens looked small, washed out, and too far away from the back. I’m not sure if the bigger replacement screen installed after lunch was any better. Next time, it’s either we set strict requirements for the speakers slides (high contrast, minimal text, exaggerated proportions) or we find better screens. I’d say the former is more doable. I almost couldn’t be at the conference that day because when the AIM security guard scanned my forehead, the temperature read 37.7 degrees. After five minutes of rest it rose to 38. I got kicked out of the building. Don’t ask me how I got back in (I’d have to kill you), but I can assure you that despite my hypochondria for the rest of the day, I had no other swine flu/A(H1N1) symptoms. I’m still fine! I still can’t explain why I had a fever that morning; I wasn’t even feeling remotely ill. Regnard says it might have been an adrenaline rush. It’s been only 10 months since this little wish finally got fulfilled, but it’s been a long, expensive, debate-filled, sleep-robbing ride. And it’s really just the beginning. The real test is in keeping all of this up. You think we can do this? With your help, most definitely. 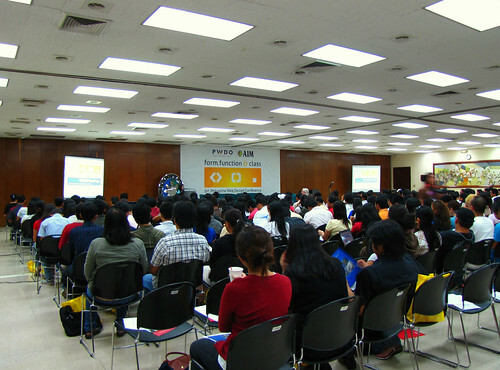 Stay tuned for the upcoming mini web design conferences, and see you at the second big one next year! Super late feedback, but since you’ve got a year to plan for the next one, I guess there’s lots of time for this. The other thing I would suggest is that you make an event of the after-party as well, because this is where you make the social connections that make these conferences successful in the long-term. Simply sending everyone home afterwards wastes the excitement and energy levels that you spent the whole day building up. Generally you’ll get a small crowd of about 10-20% of your total attendees showing up at the after-party, and you can use that time to get direct feedback and exchange notes with the participants that liked what you were doing. Yup, extra extra leeway as much as possible. I won’t go into details here but we did discuss having an afterparty; unfortunately the idea fizzled due to several reasons. But yeah, networking has to be a priority. You started well and the starting jerks are very important as they give you foresight into what to plan for the future conferences.